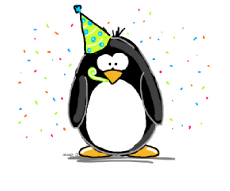 Chill out with these fun Penguin themed birthday ideas and games. A penguin themed party is perfect for kids of all ages and can be held at any time of the year. Make snowflakes by cutting blue or white paper into snowflake shapes and then write information on the back. Black and white tuxedo cards. Print out party information on a small card and attach to black bow ties. Ask party guests to wear the Penguin ties to the party. You can decorate a Penguin birthday party several different ways. Use black and white for everything, decorate in whites and blues to look like snow or combine the two. Make the front yard look like an iceberg by spray painting large cardboard boxes or hay bales white and stacking them around the front of the party venue. Make penguin foot prints from orange or black paper and tape then to the path leading to the party venue ... or simply draw them on the sidewalk with sidewalk chalk. Place cotton batting around the Penguin party area to look like snow drifts. Snowflakes can be bought or made and hung from the trees and taped to windows and the doors of the party entrance. The party table can be made to look like it's covered in snow by using a white tablecloth and cotton batting for snow drifts. Or decorate in white and black to match the penguin colors. Place small silver dishes filled with sugar cubes (ice cubes!) and have the birthday guests place them in their Kool-Aid (serve non sweetened Kool-Aid). Kids race to see who's team can complete a course while walking / running with a balloon between their knees. Divide guests into two teams and have them line up at the starting point. On the other side of the game area set up orange cones or chairs to mark where they need to run to (and around) before they run back to their team. They then hand the balloon off to the next person on their team and so on until everyone has had a turn. First team with all of their "penguins" across the finish line wins. If they drop the balloon they must return to the starting line and begin again. Tip: Blow up several balloons for each team in case they pop. Kids have to hop from one end of the room to the other and back using only pieces of a frozen island. You will need shapes cut from blue poster board that are large and look like islands. You will need one more per team then the number of kids on that team. Line the kids up in their teams and give them their island pieces. They have to lay the pieces on the floor (the ocean) in a straight line towards the other end of the room and they each have to hop onto an island piece. The leader will put down an island piece, hop on it, then put down another piece in front of them, hop onto it and so on while their team is hopping onto the pieces behind them as they move up the line. When they are standing on their last piece they take the piece from the back of the line and hand it down the line to the front. The leader puts down the piece in front of them and they all hop up one space. Then they continue moving a piece from the back to the front until they have completed the relay. First team across the finish line wins! Marshmallow sprinkle skewers - Skewer a large marshmallow on the end of a wooden skewer and dip one of the ends of the marshmallow in water. Shake off the excess water and then roll the marshmallow in a dish of sprinkles. So cute!! Black and white patterned fabric or black and white penguin printed bandanas ... wrap up party favors in a square of material and tie the ends together. Then tie black and white curling ribbon or raffia in a bow at the tied ends.